Posted on August 23, 2018 by Wise Eats. If you’re tired of all the fitness and nutrition gimmicks and want to know how to lose weight for real, you’ve come to the right place. Welcome to Wise Eats. Like this video by clicking the thumbs up and subscribe to my channel! I’m Wes Wise from WesFitness.com. Back in 2009 I lost 90lbs and in this video I tell you exactly how I did it. At that time, my lifestyle was the worst of the worst. I barely exercised. I ate junk food every single day. I drank soda with every meal, smoked a pack of cigarettes a day, and drank alcohol multiple times a week. I was on a one-way path to nowhere fast. Finally, I woke up one day and realized it was time to WISE UP. I was 270lbs and ready to make a change. So, I set a goal to lose weight, and was determined not to fail. So, how did I do it? Step 1 was starting a diet journal. I wrote down all of my meals and calories. I used a calorie calculator to figure out my daily needs and ate 2-500 calories below that number. This created a calorie deficit, which is essential for weight loss. To lose weight, you need to take in less calories than your body burns. Tracking your meals is a great way to accomplish this, and it can be tedious, but I promise you it works. I still do it to this day in order to accomplish my fitness goals more quickly. Step 2 was exercise. I did a lot of running mixed with some weight training. Today, I lift weights 5-6 days per week and believe it’s the most effective form of exercise for burning body fat and achieving a lean physique. Step 3 was changing my diet. Throughout the weight loss I was still having lots of processed diet foods, junk food, alcohol, and cheat meals several times a week. As long as I restricted calorie intake during the week, I allowed myself to fly off the rails on the weekend. Not a very healthy way to go about losing weight, but it worked. Overall, I was taking in less calories than my body needed, so I lost weight. Eventually, I started to prepare more meals at home and quit drinking pop, but still ate very poorly throughout the initial weight loss. Through calorie counting I lost 1-2lbs per week. I would weigh myself at the same time every Monday and record my weight each week. Over time, the weight loss was consistent. I dropped from 270 to 180lbs over the course of 1 year. You can see many before and after pictures in the YouTube video. There was no rocket science involved in my weight loss experience. Losing weight comes down to discipline, a little effort, and eating below your daily calorie requirements. Assuming you have no pre-existing health conditions, calories in vs calories out works. The more disciplined you are with your calorie intake, the faster you will see results. If you think you need some magical diet fad, or a pill, or a bunch of expensive supplements, it’s time to WAKE UP. If weight loss is what you truly want, make it a goal and get after it! I’m no nutritionist or fitness expert. I’m just a normal guy who decided it was time to get healthy and lost 90lbs. If I can do it, you can do it. It’s time to start caring about your health. If weight loss is your goal, I can say from experience that calorie restriction will get the job done. Now, if your goal is to build an athletic physique and achieve optimal levels of health, that’s a whole different story that goes far beyond calorie counting and weight loss. I will get more into that in future videos, so make sure you subscribe and turn on notifications so you never miss an opportunity to Wise Up. 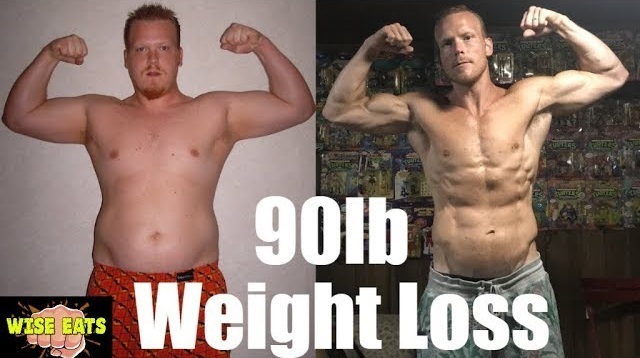 For now, you can find more details of my 90lb weight loss along with recipes, exercise regimens, fat loss tips, and more over at WesFitness.com. If you liked this video, please click the thumbs up also leave a comment or question on the YouTube page. You can also message me over at Wise-Eats.com or WesFitness.com (Both links get you to the same place). I’m eager to help and respond to all messages. It is within you to take control of your health. Start today with one wise choice. Small changes now add up to major benefits in the future. Thanks for watching!